Neytiri was born in our cattery out of Galatea and Jack Driscoll. She has all our base-cats in her pedigree. 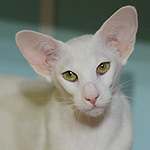 I hope to take one litter from Neytiri for work with white cats in future.